Rita is having a bad day at work and she needs your help. Click here to play! If you can help her get through the day you’ll be handsomely rewarded for your efforts. Rita’s obnoxious boss is one of the worst aspects of her day. Play interference by spinning this cheeky guy across the reels. He acts as a substitute and will replace all other symbols, excluding Rita. He will also payout the top prize of the game of 5000 times your line bet if you can spin five of the boss on an active payline. You’ll also need to help Rita out with some of her work to ease her tension. Spin in symbols such as staplers, ID tags, and stacks of paperwork to help her out and bring in plenty of big wins. Watch out for the battered computer as this is a scatter symbol. It will not only multiply your total bet, but it will also trigger a bonus feature when you spin three or more anywhere on the board. Rita herself is another special symbol. She is also a scatter symbol and will trigger another bonus feature if you spin her on selected reels along with the boss symbol at the same time! Help Rita through her day and collect a huge cash prize. There are a couple of different scatter symbols in this game: the shattered computer and Rita the office worker. Each will multiply your total bet if you can spin two or more anywhere on the board. They will also trigger bonus features. The unbearable boss is a wild symbol. He will replace most other symbols to help you bring in more wins. He will also payout up to 5000 times your line bet if you spin two or more across an active payline. There are two different bonus features in this game. The first is triggered by three or more computer symbols anywhere on the board. 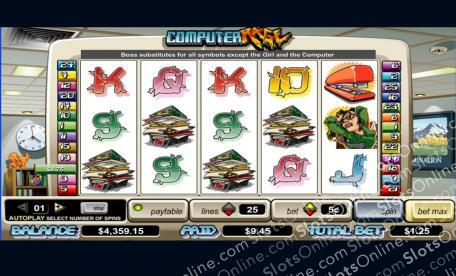 During this game, you will get to choose from a selection of windows to reveal your bonus prize. The second is triggered when Rita appears on reels 4 and 5 and the boss appears on reel 1. During this game you will get to smash several different computers to reveal your bonus prize.